West Virginia teachers reached a deal with lawmakers and Gov. Jim Justice Tuesday morning, which ends their historic nine-day strike. The news broke when Justice, a Republican, tweeted that all state employees — including teachers and other school employees — will receive a 5 percent pay increase next year. Conservatives in the state Senate have apparently resolved their fiscal objections to the plan. We have reached a deal. I stood rock solid on the 5% Teacher pay raise and delivered. Not only this, but my staff and I made additional cuts which will give all State employees 5% as well. All the focus should have always been on fairness and getting the kids back in school. Teachers celebrated the announcement as a win. “With this agreement today to reduce spending in state government, in order to give every single dollar available to our public employees, we’ve achieved the goal of being fiscally responsible while also getting a pay raise that will help our teachers get back in the classroom and our students back to school,” said Republican Senate Majority leader Ryan Ferns. 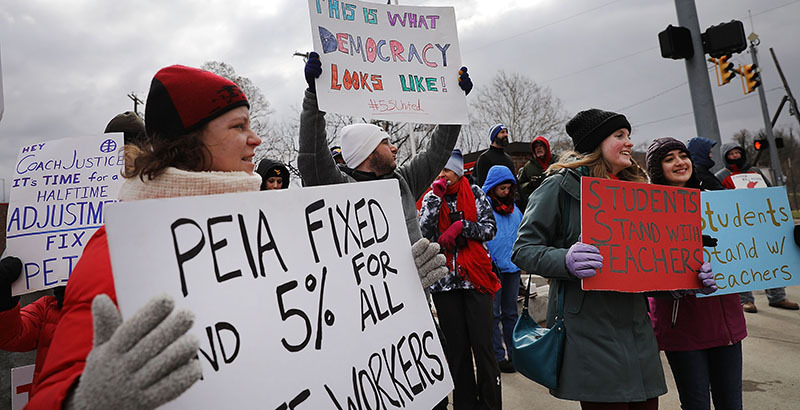 The governor also froze the current funding structure for the Public Employees Insurance Agency and created a task force to discuss ways to fix the agency, which teachers said had been raising their healthcare costs as their salaries stayed stagnant, WV Metro News reported. The state will cut spending from a few different areas, including tourism, Medicaid, and general expenses, to pay for the raises, which are expected to cost about $110 million. The strike started February 22 as a rejection of a 2 percent pay increase for teachers, which the legislature passed and the governor signed. Justice and union leaders came to a tentative agreement February 27, but some state senators declined to support that plan because of the cost, which extended the strike. Average teacher pay in West Virginia ranked 48th nationally in 2016, at $44,701, according to the West Virginia Education Association.